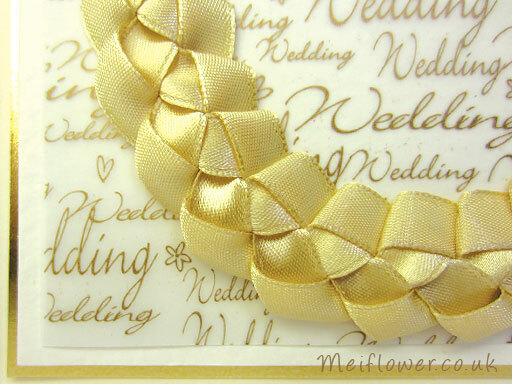 This week we have a cracking offer on honey gold satin ribbon at MeiFlower. You can save 25% off the price for a 23m roll of gorgeous satin ribbon. That works out at£1.49 for the full roll! 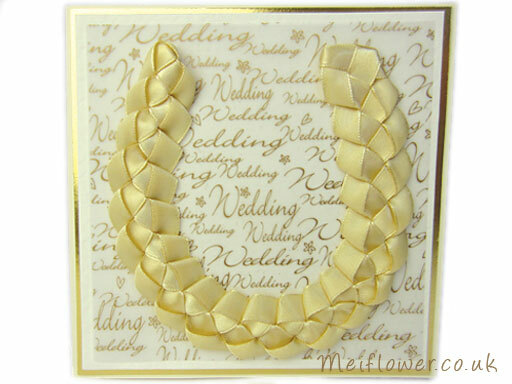 To give you an idea on a different use for the satin ribbon I have made a wedding card decorated with the honey gold satin ribbon, weaved into a decorative horseshoe shape. I have used about 2.5 metres of ribbon for the card below. Here is a link for the ribbon wreath video which shows you how to do the ribbon weaving. This entry was posted on Friday, May 24th, 2013 at 11:05 am	and is filed under Special Offers, Wedding Cards. You can follow any responses to this entry through the RSS 2.0 feed. You can leave a response, or trackback from your own site.